Watching a hummingbird is enchanting. Their tiny size and incredible speed make them a natural wonder. Flapping their wings an estimated 70 times per second, they can move in every direction, or simply float majestically in midair. The National Audubon Society says to sustain their supercharged metabolisms, hummingbirds must eat once every 10 to 15 minutes and visit between 1,000 and 2,000 flowers per day. When you provide a safe, reliable food source, it’s like putting out a welcome mat for hummingbirds. Hummingbirds are specialized for nectar-eating, evident by long bills and grooved tongues ideal for probing flowers. Sugary nectar supplies fast energy and makes up 90 percent of a hummingbird’s diet. Unfortunately, due to development and climate change, hummingbird-friendly habitat may be changing across many hummingbird migration routes. You can create a healthy environment for hummingbirds with these steps. • You can attract, feed and nourish hummingbirds in your backyard with a few easy steps. Flowers, perches, insects, and water are the key ingredients to a healthy yard that will attract these amazing jewels. 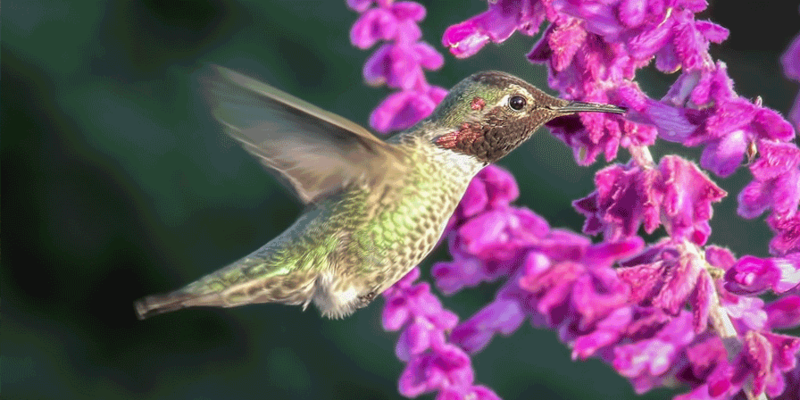 Fill your yard with some of the most common native plants that hummingbirds love: Beebalm, Cardinal flower, and Sages. • Plant native red or orange tubular flowers to attract hummingbirds, in addition to native plants rich in nectar. • Leave some sticks and small branches on bushes and trees to enable ready perches for hummingbirds. • Minimize or eliminate the use of pesticides in your yard. • Be conscious of beneficial insects: Small insects are an important part of a hummingbird's diet, providing essential protein to complement the nectar they drink. Try using manual or natural insect control in the afternoon when insect populations decrease. • Do provide a water feature: Hummingbirds adore bathing. If you add a drip fountain or mister to your yard, they'll bask in the wet wonder. • Do check feeders regularly: Check at least bi-weekly to ensure a steady supply of fresh food. Clean the feeder as needed with one part white vinegar to four parts water. • Don't add red coloring to food: While hummers are attracted to red, adding dye to their food is unnecessary and could be harmful to their health. • Encourage your neighbors to make their yards hummingbird friendly. An entire corridor of habitat is much more valuable than scattered patches.